Generally, when a resort is all inclusive, this means that the price of your stay includes meals and beverages, including drinks from the bar. The Sandals and the Beaches resorts are Luxury All Inclusive resorts. The price of your stay includes airfare; transfers to and from the airport; unlimited gourmet dining; unlimited premium brand liquors, beer, wine and champagne; water sports such as SCUBA, snorkeling, sea kayaking, wind surfing, waterskiing and more; golf at some resorts; taxes, fees, gratuities and much more. Why should I choose an all inclusive resort for my honeymoon? If you are like most couples, wedding planning means lots of thinking about budgets. And by the time the wedding day arrives, you are sick and tired of thinking about money. With an all inclusive honeymoon, you get a "two-fer:"
1. When you look at your wedding budget, you know exactly how much the honeymoon will cost. You pay for your honeymoon before you travel (like most any other trip), and after that you do not have to pay for ANYthing else. Compare this to a cruise. When cruising, you have an on-board charge account that all bar drinks (including sodas), tours, gratuities, etc. will be charged to. Before you leave the ship at the end of the cruise, you will be asked to settle that account by paying cash or placing it on a credit card. I've known honeymooners that spent almost as much to get off the boat as they did to get on. You don't want to leave your honeymoon feeling disapointed that you spent more money than you planned to. 2. While you are on your honeymoon, you don't have to think about or discuss money. I tell honeymooners, you certainly don't want to be discussing what you can afford for dinner tonight. You want to be in the moment, making the most of your special time together. Compare this to a honeymoon in Paris. When traveling in a big city, each night you will choose a restaurant for dinner. You want to dine in romantic, gourmet restaurants, and you want him to be able to order a steak for dinner without worrying about how much it will cost. Why should I choose a Sandals resort for my honeymoon? There are 13 Sandals resorts. Each resort has a unique personality. One of them will be a perfect match for your vacation style. There are Sandals resorts on 5 Caribbean islands - Jamaica, St. Lucia, Antigua, and two islands in the Bahamas. Sandals is for couples. You can rest assured there will not be children splashing in the pool or crying at the dinner table. This is not the case at every all inclusive resort. Each Sandals resort has at least 7 restaurants. Most all inclusive resorts will offer multiple restaurants. The difference at Sandals is each restaurant has its own theme, its own kitchen and its own chefs. So the food in each restaurant is different and gourmet. You will have a unique dining experience each place you eat at the resort. At Sandals, expect the best of everything. 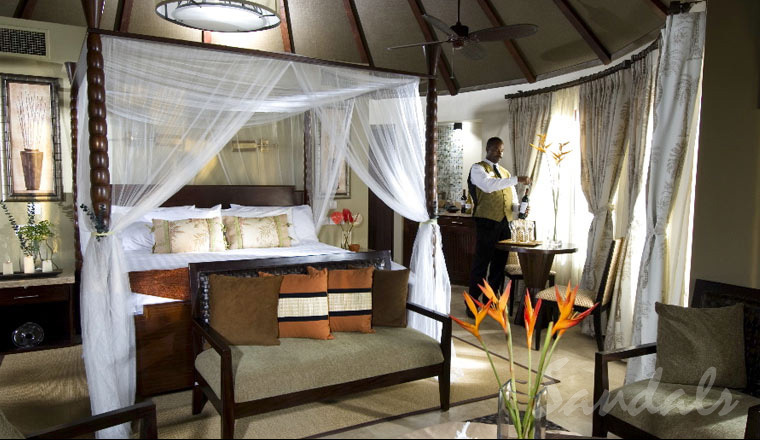 Each room has a 4-poster mahogony bed. At the bar you will see premium brand liquors. The beach chairs are actually comfortable. The skiboats are Mastercraft, and the diveboats are Newton. The staff is highly trained and exceptionally friendly. 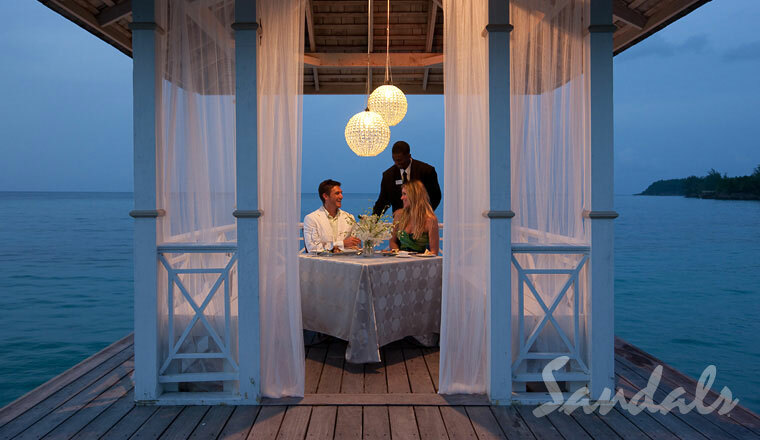 At the end of the day, there are two reasons I recommend Sandals resorts to honeymooners. First, I am 100% confident my clients will have a honeymoon that exceeds their expectations. And because at Sandals, LOVE is all you need - everything else is included.